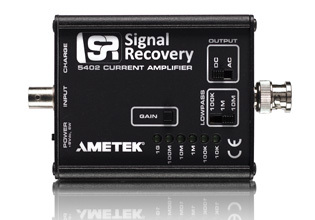 The Model 5402 is a low noise current input preamplifier designed for use whenever the signal source is a current source - for example, an electron multiplier, ion collector, photo multiplier, or photodiode, or when measuring sample impedances. The gain (transimpedance) is switch selectable with six settings enabling the amplifier, on its most sensitive range, to detect fractions of a picoamp without noise degradation. The unit has a bandwidth of 100 kHz on its highest gain (1 GV/A) and greater than 4 MHz on its lowest gain (10 kV/A), while still maintaining low input current noise ranging from 25 fA /√Hz on the 1 GV/A range to 5 pA/√Hz on the 10 kV/A range. The gain setting is changed by simply pressing a push-button, with the present setting being indicated by an LED. The setting is retained when the power switch is turned off and restored when it is turned on again. Switch selectable output filters allow AC or DC output coupling, and three choices of low pass filtering which can reduce overall noise, especially when working at high gains if the full bandwidth is not required. The Model 5402 is powered by two internal lithium-ion rechargeable batteries which allow operation for up to 48 hours on a single charge. This method of powering delivers the lowest possible noise as well as allowing isolated operation, preventing problems which might be caused by ground loops. A plug-in line power supply, model PS0112, is included which is capable of recharging the batteries in one model 5402; recharge time is a maximum of three hours. Output Coupling (high-pass) When set to DC, amplifier is DC coupled. Internal Rechargeable lithium ion batteries provide up to 48 hours of use.